The judiciary of Ukraine in for landslide change. President Petro Poroshenko introduced to the Verkhovna Rada a bill on judicial system and status of judges, which is a key element of the long-overdue judicial reform. The draft bill №4734 of May 30 is registered on the Rada website on Tuesday morning and is marked as urgent. The new law consists of 12 chapters and 160 articles. It lays down the basis for the organization of the judiciary, the judicial system of Ukraine, judicial self-government, regulates the work of judges and juries and their work remuneration, the procedure of appointment of judges, determines the criteria for the appointment and dismissal of judges, disciplinary responsibility of judges, etc. 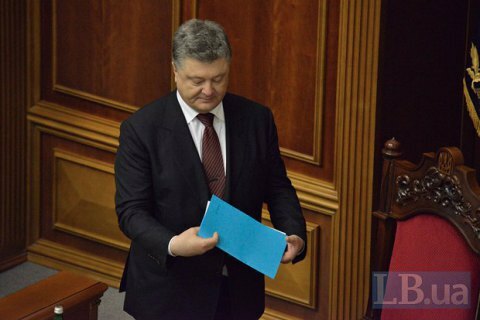 President Poroshenko notes in the explanatory memo that the bill is one of the key element of the judicial reform and will allow to transform the judiciary system and upgrade the judiciary, to create a model for the functioning of the judiciary, which would satisfy the public demand for a fair trial. the bill provides for a gradual increase of salaries of judges in order to attract professionals. Amendments to the Constitution related to the issues of justice should be voted along with this bill.